The guys (and girls??) over at 360 have been going through a number of ways to multiply, and with some contributions from several others are approaching 25 (more or less) different ways to multiply two numbers. I am on my road trip across America's Midwest and southwest (today from Roswell NM, where the Aliens abide) but finally found a moment to write. And as it seems to happen with things like this, I was going through some old journal articles that Dave Renfro had sent me, and came across a posting in the September 1921 Philosophical Magazine with the catch title, The Mental Multiplication and Division of Large Numbers, by V. A. Bailey, M.A. ; Queen's College, Oxford. 2) Less liable to error. 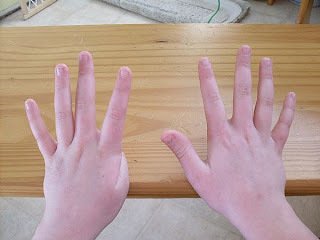 3) Less Fatiguing for Large Numbers. 4) By reversing the process we can perform long division mentally. I will ignore the last , and illustrate the method, then amplify a little about its history (which goes well before 1921). for ease of operation, I will use a smaller pair of numbers than the author, who multiplied 24968 by 4352. I will instead use 257 x 62 to shorten the process. Write the first number on a piece of paper, and then the second number should be written backwards on a seperate piece of paper. But of course, nothing is new under the mathematical sun, and the method had been previously described in Nature in the Dec 31st issue of 1891 by a Dr. K. Haas. But Dr. Hass mentioned that he had not invented it, and that it had been mentioned by Pappus, who credited to Appolonius of Pergia (circe 250 BC); and had also been known to the Hindus under the name of Vajrabhyasa. "On November 23, 1910, Dr. Hawley Harvey Crippen, born in Coldwater, Michigan, in 1862, was hanged in London for the murder and dismemberment of his wife. It was one of the most notorious English murder stories in history, second only to Jack the Ripper. Today, forensic biologist Dr. David Moran has completed a study and proven that the remains of the body found were not actually those of Dr. Crippen's wife, and proved that Dr. Crippen was wrongfully executed." I didn't go all the way to Chicago, but turned south into Indiana "Back home again... in Indiana... sing children... and stumbled across the home town (Wawaka, Indiana) of former Baseball Commissioner Ford Frick.. the guy who said Maris should have an astereisk on his home run record (boo). In the June issue following the Maskelyne trisection article I mentioned, there was a post by J. R. Cotter, that proposed a simple, exact (within mechanical limits) and apparently original trisection device. 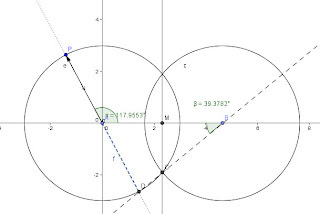 I have created a geogebra aplet to emulate the method for those who wish to explore. The idea, shown in the image above is as follows. 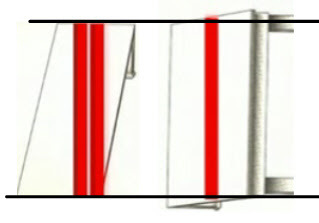 A mechanical linage with four pens labeled A, B, C, and D is created so that A is fixed at the vertex of the angle, and B is allowed to slide along one ray of the angle. Pens B, C, and D are constrained to a straight line, and the distances AC, BC, AD are all equal. 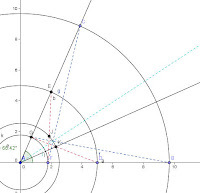 AS B is moved along the ray of the angle, the point D will be moved around the fixed point at A. When D is aligned with the line along the terminal ray of the angle, the angle ABD is 1/3 of the original angle. "The Trisection of an angle, irrespective of its magnitude, by means of any geometrical construction, has been regarded as impossible. The problem has been associated with perpetual motion, the transmutation of metals, 'zetetic' astronomy (the term zetetic was associated then, and perhaps now, with a psychic approach to knowing), and similar absurdities. Mathematicians have spoken in no measured terms of the folly displayed by those who, in the face of proved impossibility, attempt to provide a solution. And yet, he goes on to supply what he thinks is a geometric trisection. "Take any angle BAC and at regular distances from A, describe the arcs FG, DE and BC with A as center. Join, respectively BG, CF, DG, and EF. The line AIH, of course, bisects the angle BAC. 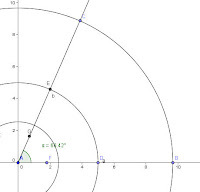 I have created here a geogebra page which will reproduces his (very nearly) trisection of an angle. 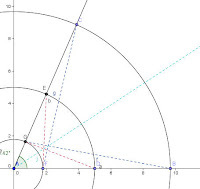 In the following month, the first post illustrating the error in his method was presented, and in the following months and years, a number of people sent mechanical means of approximating the trisection of an angle. Because It amuses me, I will try to followup as soon as possible with geogebra illustrations of a couple of the methods. The first, written on 16 April of 1912, begins, "Gentlemen, It seems unnecessary to give any formal proof that Mr. Maskelyne's construction cannot trisect an angle with exactness; but it may be of some interest to estimate the degree of accuracy in his approximation." The post then goes on to estimate that for a small angle, the error would be about the cube of the angle. It then gives a listing of the errors for angles of 30o (about .10 degrees), up to 150o (almost 5degrees error).. The Nevil Maskelyne who wrote the communication was not just a typical mathematical kook. He was a Fellow of the Royal Astronomical Society and had participated in and contributed to the observation of the corona of the sun in the US and was apparently a descendant of either the Astronomer Royal, or the brother of the Astronomer Royal of that same name; the Nevil Maskelyne who had been the nemesis of Harrison in his quest for the Longitude prize. 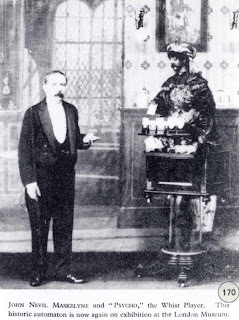 His father (pictured at the top) was a famous magician and spiritualist who invented many tricks that are still performed by modern stage magicians. Interestingly, his father was also the inventor of the pay toilet mechanism. One historical reference lists, "was the best known magician in late 19C England and also a notable mechanic and inventor. He invented the coin lock as used in pay toilets, several proportionally spaced typewriters and he built numerous automata. His whist-playing 'Psycho' [see image at top] of 1875 should be in the London Museum.... There seem to have been two versions - the earlier could do arithmetic, but the later smoked a cigarette instead. The Maskelyne family presented it to the London Museum in 1934. The Director of the Museum recently told me that Psycho is not working. I have been told that a version has been restored to working order by a collector in Los Angeles"
If anyone has information on this, I would love to know. ** CLAIMED***Numerical Solutions of Differential Equations; H Levy and E. A. Baggott... This is a Dover paperback in excellent shape and is listed as "First American Edition, 1950"
If this works, I'll add more later, and if you have some old books you would like to swap, I'm still looking for things to fill the vacant places I just made on my bookshelf. Archimedes Knew How, Do You? Reading through some old (1920) notes from the Philosophical Magazine that Dave Renfro sent me (THANKS, Dave) and came across a nice problem based on an old principal of parabolas known to Archimedes. The method, I learned in the article, was used by Archimedes in his On Floating Bodies, book two.. in the course of investigating the equilibrium of a floating paraboloid of revolution.. In the process he uses this theorem and quotes it as if it is well known... Yet it seems not to appear in texts then (1920) or now. 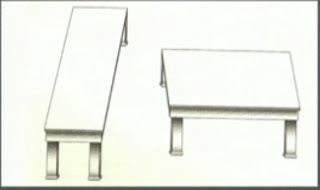 Through AB draw a line,r, parallel to the tangent line, t.
The Pigeon Hole Principle......The basic idea behind this mathematical principle is what students would call common sense; if there are n objects to be placed in m receptacles (with m less than n), at least two of the items must go into the same container. While the idea is common sense, in the hands of a capable mathematician it can be made to do uncommon things. Here is a link to an article by Alexander Bogomolny in which he uses the principle to argue that there must be at least two persons in New York City with the same number of hairs on their head. This "counting hairs" approach dates back to the earliest version of the principal I have ever seen. we use also:"the principle of the drawers of Dirichlet"
that is 'Zasada szufladkowa Dirichleta' ". I received a note that said, "Dirichlet first wrote about it in Recherches sur les formes quadratiques à coefficients et à indéterminées complexes (J. reine u. angew. Math. (24 (1842) 291 371) = Math. Werke, (1889 1897), which was reprinted by Chelsea, 1969, vol. I, pp. 533-618. On pp. 579-580, he uses the principle." "I asked M. Nicole (See below for description of M. Nicole) one day what was the character of Mme. de Longueville's mind; he told me she had a very keen and very delicate mind in knowledge of the character of individuals, but that it was very small, very weak, very limited on matters of science and reasoning, and on all speculative matters in which there was no question of sentiment ' For example,' added he, ' I told her one day that I could bet and prove that there were in Paris at least two inhabitants who had the same number of hairs upon their head, though I could not point out who were those two persons. She said i could not be certain of it until I had counted the hairs of the two persons. Here is my demonstration/ I said to her: M lay it down as a fact that the best-fiimbhed (not sure what this word was supposed to be, ..Plumbed??) head does not possess more than 200,000 hairs, and the most scantily furnished head b that which has only 1 hair. If, now you suppose that 200,000 heads all have a different number of hairs, they must each have one of the numbers of hairs which are between 1 and 200,000; for if we suppose that there were 2 among these 200,000 who had the same number of hairs, I win my bet But suppose these 200,000 inhabitants all have a different number of hairs, if I bring in a single other inhabitant who has hairs and has no more than 200,000 of them, it necessarily follows that this number of hairs, whatever it b, will be found between 1 and 200,000, and, consequently, b equal in number of hairs to one of the 200,000 heads. Now, as instead of one inhabitant more than 200,000, there are, in all, nearly 800,000 inhabitants in Paris, you see plainly that there must be many heads equal in number of hairs, although I have not counted them.' Mme. de Longuevillle still could not understand that demonstration could be made of the equality in number of hairs, and she always maintained that the only way to prove it was to count them. " The M. Nicole who demonstrated the principal was Pierre Nicole, (1625 -1695), one of the most distinguished of the French Jansenist writers, sometimes compared more favorably than Pascal for his writings on the moral reasoning of the Port Royal Jansenists. It may be that he had picked up the principal from Antoine Arnauld, another Port Royal Jansenist who was an influential mathematician and logician. Here is a segment from his bio at the St. Andrews Math History site. He published Port-Royal Grammar in 1660 which was strongly influenced by Descartes' Regulae. In Port-Royal Grammar Arnauld argued that mental processes and grammar are virtually the same thing. Since mental processes are carried out by all human beings, he argued for a universal grammar. Modern linguistic theorists consider this work as the beginnings of the modern approach their subject. Arnauld's next work was Port-Royal Logic which was another book of major importance. It was also strongly influenced by Descartes' Regulae and also gave a first hand account of Pascal's Méthode. This work presented a theory of ideas which remained important in philosophy courses until comparatively recent times. In 1667 Arnauld published New Elements of Geometry. This work was based on Euclid's Elements and was intended to give a new approach to teaching geometry rather than new geometrical theorems." He was a correspondent of Gottfried Wilhelm Leibniz, and of course Pascal, who wrote the Pascal "Provincial Letters" in support of Arnauld. I enjoyed the quote about him from the Wikipedia bio: "His inexhaustible energy is best expressed by his famous reply to Nicole, who complained of feeling tired. 'Tired!' echoed Arnauld, 'when you have all eternity to rest in?" I have not been able to find any thing in Arnauld's personal writing at this time to confirm that he was aware of or used the Pigeon-hole Principle. I have also seen a comment that there is a book by Henry (or Henrik) van Etten (pseudonym of Jean Leurechon, who coined the term thermometer) , circa 1624, which uses the method for problems involving "if there are more pages than words on any page" and various other illustrations. The writer suggests that the problem is in the French version but not the English translation. Would love to hear from someone who can confirm, and perhaps send a digital image. Fool me once, Fool me Everytime? Concurrency is the term, I think; you see an idea and then wham, bam, bang, it comes at you several more times. Well, right now it seems to be illusions and our inability to believe our own lying eyes. Several nights ago I was flipping through the new Ted blogs and they had one by Dan Ariely, the author of "Predictably Irrational." If you teach Stats or any of social science, you need to watch this one, but it is about 17 minutes long, so here is the part about what I'm talking about. He shows the picture at the top...Then he shows the two tables with a red line on each one, and finally he rotates the line so that you can see (at least if you believe he didn't shrink the line as he rotated it), that the two tables are both the same length. Now take the lines away... admit it, the table on the left looks longer. I even cut a copy of each table from the video, put them side by side on my smart board, then rotated one and drew parallel lines through the two red lines... the same.... rotate it back???? ARRRGGGHHHHH! It is two parallelograms that have equal length diagonals... only they DON'T look equal. You can measure, and sure enough, spot on, as the British folk say. Sooooooooo I built one. I laid out a Geogebra spred that would allow me to adjust the angle of the two parallelograms, and the bases of them, while keeping the diagonals the same (a little hidden circle).. So try it your self, survey your class.. is there an angle that makes it seem the MOST different? Does it matter if we adjust the bases??? Here, for you to try, (if I did this right) is a JavaG-bra that will allow you to move a few points around and compare. And just to show I have only my arm up my sleeve, the picture on the left shows the hidden circle in the construction. It seems that the diagonal shape gives the illusion of perspective, and the longer box seems to go "deeper" into the picture... at least that's what it looks like to me, but hey, you can't believe what I see. While sending me some old documents recently in my quest to track down the first use of !n for the subfactorial symbol, Dave Renfro sent me an electronic copy of an old "Mathematical Questions from the Educational Times", 1880. With time on my hands I was looking through them when I came upon the one above. Not a remarkable problem, but it did remind me of a recent problem I came across that said something like "Prove that 2009 can be written as the difference of squares of two integers." A no brainer, every odd number is the difference of two squares since (n+1)^2 -n^2 = 2n+1. But after reading the old problem, I began to wonder if 2009 could not be done as the difference of two squares in more than one way. As it turned out, it could... in fact, it could be expressed in that form in three ways... 10052 - 10042, and 1472-1402, and again as 452-42. Perhaps it would not have registered on me, but I noticed that the differences between the squares, 1, 7, and 41 were all factors of 2009. So I tried 2007 = 32(223) and sure enough it could be written as 10042-10032, or as 3362-3332, and also as 1162-1072; differences of 1, 3, and 9. The remaining factors, 223, or 669 (and of course 2007) were too big to be differences (later I realized they were sums, duh). Its a simple idea, so why did I have to struggle with a very old, very much harder problem to have it fall apart for me??? Now I'm going to go think about the even numbered years..... hmmm... but ONLY the leap years. which comes from the questions section of the MAA in 1958. It was obvioulsy not an immediate success, as I also found the use of Chrystal's inverted exclamation mark in "A Note on Derangements", by M. T. L. Bizley © 1967 The Mathematical Association. A UK based association. If any of my British readers know what symbol is currently in use in the UK I would appreciate a note. Even though he was writing only about 40 years after the symbol was created, he was mistaken in assuming that the name came after the symbol. The word factorial was the creation of Louis François Antoine Arbogast Who died in 1803. The symbol now commonly used for factorial seems to have been created by Christian Kramp in 1808, and Jarrett, who created the symbol that Whitworth thought might have been the forerunner of the name, was born two years after Arbogast died, making him three years old when Kramp first used !n. Jarrett invented his symbol in 1827. It occurs in a paper "On Algebraic Notation" that was printed in 1830 in the Transactions of the Cambridge Philosophical Society. I should add that it is often the case in modern usage, that writers choose to ignore all these symbols for a function approach, with the most common being a D(r), perhaps for Derangements. If you have a book from any period that addresses the topic, I would be grateful for a short comment telling me what symbol (if any) they used, and the year, title and author... (and if your symbol is not shown here, or your date of !n preceedes the 1958 one above, and electronic image would earn my deep gratitude and a mention in some future post). Where Are Your Intended Learning Outcomes? Not sure of the original source of this but got it today from Dr. Robert Anderson, my dean at University of South Florida. 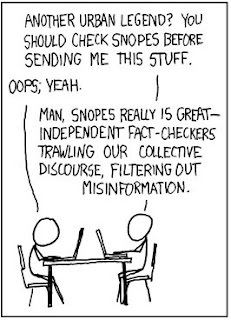 My recent post mentioning the snopes debunking site reminded me of this classic from the folks at XKCD , which dubs itself as "A webcomic of romance, sarcasm, math, and language" and frequently lives up to that billing. Every one gets one now and then; an email asking you to share this new miracle discovery, or warning you of the dangers of cell phones exploding in your pocket, and a thousand other urban hoaxes that are circulated by "pass this on" emails. But before there was the Internet, there were men like Richard Adams Locke, a descendant of the famous philosopher, who reached levels of sensationalism not heard of by modern day Internet users, most often, to sell a 2 cent broad sheet. In 1833, Sir John Herschel sailed from England for the Cape of Good Hope, carrying a large telescope with which to view the southern stars. In the days of slow travel and communication, it would be two years before the true accounts of Herschel reached England or the US, but in 1835 a series in the New York Sun scooped the world with, "Great Astronomical Discoveries made by Sir John Herschel at the Cape of Good Hope." The first article described a plausible account of the Sun being able to scoop the world news, and went into great detail on how Sir John had been able to increase the magnification to unheard of powers by the introduction of artificial light into the tube. In my 1917 account of the story, it is said that when he heard the idea, David Brewster was so ecstatic that he, "leaping halfway to the ceiling exclaimed, 'Thou art the man!" (Honest to Goodness, check it out in Recreations in Mathematics, 1917, by H.E. Licks, page 109].. The series went on to explain the things Herschel saw with his 42,000 times magnification scope; "herds of brown quadrupeds of the bison kind, each animal having a hairy veil over its eyes." The conjecture was that the animals needed the protection for their eyes due to the extreme variation in light which they were periodically exposed. And THEN??? ".. his search was rewarded by the sight of human beings with wings and who walked erect and dignified when they alighted on the plain.. The Sun issued 60,000 copies and sold out in less than a month. Translation were made throughout Europe. Incredibly, over twenty years after Herschel returned to England, the Sun had another incredible run in 1859 with a pamphlet edition complete with illustrations. 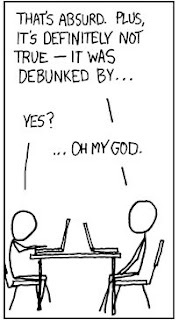 Amazingly, this was only one of many such hoaxes that have occurred before the Internet. 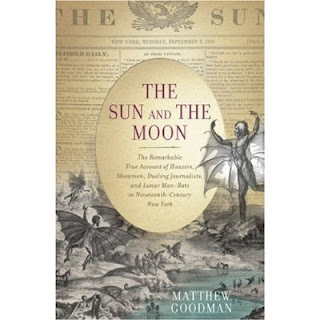 Many of them have been captured in a book by Matthew Goodman called "The Sun and the Moon: The Remarkable True Account of Hoaxers, Showmen, Dueling Journalists, and Lunar Man-Bats in Nineteenth-Century New York ".